The Falcon Eyes VL-100 is an LED lamp that straps to the head of a flashgun for use as a video light, AF-assist or modelling lamp. Do you like the idea of the Canon 320EX and wish your own flash unit had a built-in video lamp just like it? Perhaps you’re a “hybrid” photographer shooting a mixture of stills and video, or you’d like a modelling lamp (as found on studio heads) so you can see the shape of your lighting without having to take test shots first. 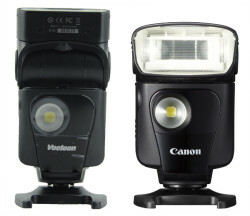 Some flashes have LED lamps in them already, such as the aforementioned Canon 320EX and Oloong 551EX (right),Olympus FL-600R and Polaroid Dua Flash, but most others rely on a quick-pulsing, battery-draining “modelling lamp” feature of the flash tube, or no such features at all. Well, you needn’t bin your flashguns and buy new ones just yet, because Hong Kong-based firm Falcon Eyes has come up with a compromise. 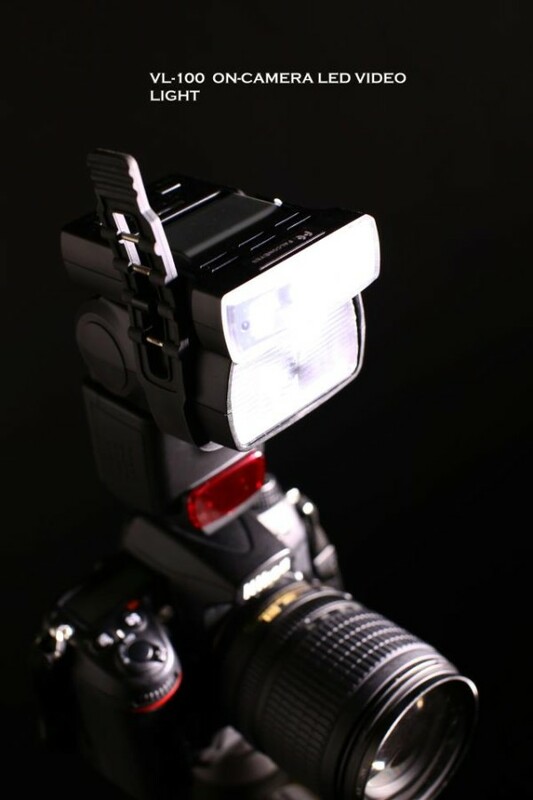 It’s called the VL-100 and it’s an LED video lamp that straps to the top of your flash head. The concept is the same as that of the Dot Line LED Panel for Speedlights, an accessory we wrote about a while ago that works as both a lamp and bounce card. Why would you want one of these things? Maybe you’re switching between stills and video so quickly that you don’t have time to take the flashgun off the camera and replace it with a dedicated video light. Or maybe you’d like a little bit of extra illumination to help you focus the lens in dim lighting conditions. Perhaps you have a complex studio setup and prefer to see how the lighting falls on your subject without “chimping“. The list price is HK$480, which works out to around US$62 or £41. The Flash Havoc weblog has posted some additional thoughts on the VL-100 and found the same product under another brand, called the Boling ‘Speedlight Partner’. You can read that here. For more information on the VL-100, visit the Falcon Eyes product page. Update: The Boling version (BL-23Z) is now available from UKphotodistro for £40. Would you get one? Post a comment below and let us know what you think.